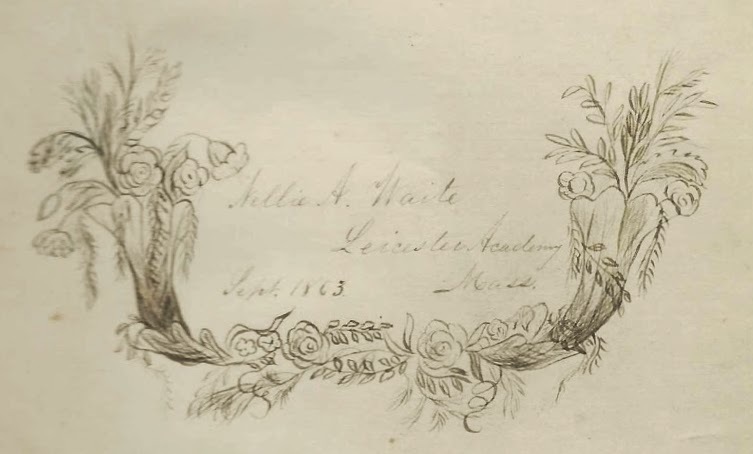 Autograph album started in 1863 by Nellie A. Waite, a student at Leicester Academy at Leicester, Massachusetts. 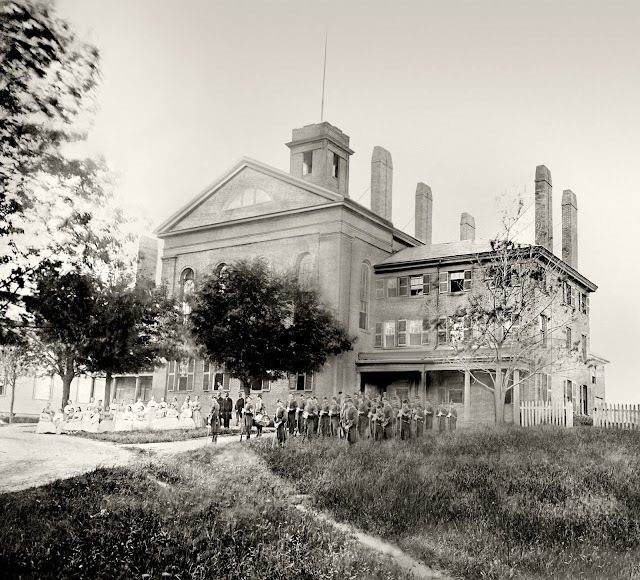 Leicester Academy was one of two institutions that eventually became what is now Becker College, whose archivist has provided an 1860s photograph of a student group standing in front of the Leicester Academy building. 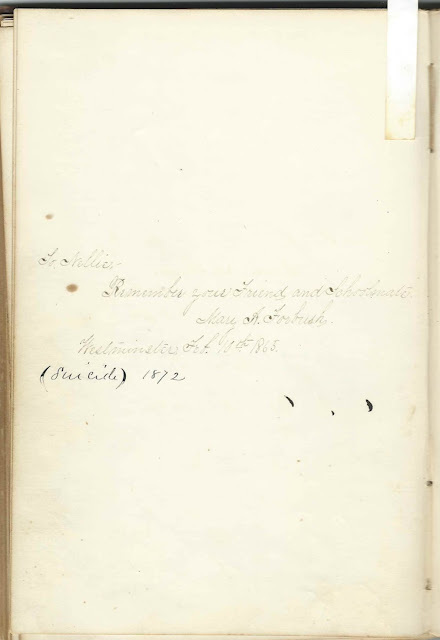 Nellie added notes to several of the pages to indicate deaths and other information. Some of the inscribers were soldiers and gave their affiliations. Many inscribers added the initials "L. C.", which may have stood for Leicester College or might have been a club at Leicester Academy. Pasted inside is a newspaper clipping about the album when it was purchased at a rummage sale about 1959, and the husband of the purchaser was offering to share a peek to anyone interested. The album apparently passed into the hands of someone else at some point and ended up advertised online, where I purchased it several years ago. Click on an image to enlarge it. 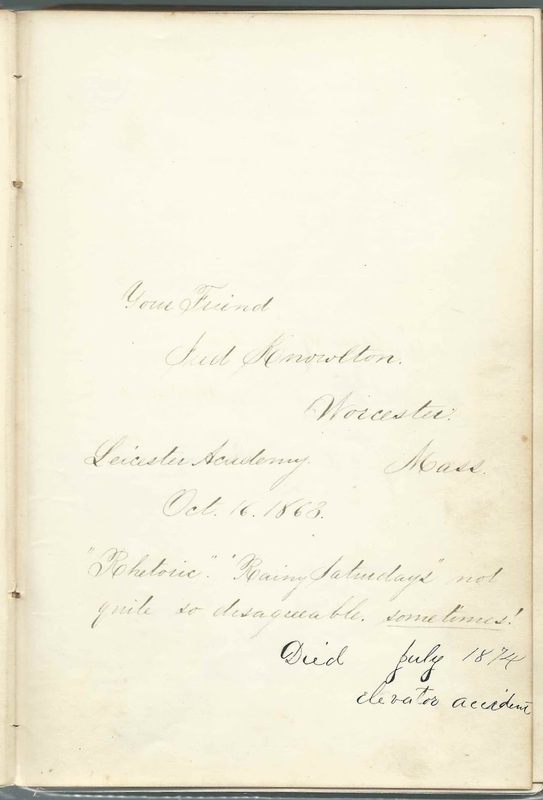 The album measures approximately 7-3/4 by 5-1/4 and contains the sentiments of 104 of Nellie's relatives, friends, schoolmates and possibly instructors. An alphabetical surname list and an alphabetical list of the inscribers, together with any personal information they offered, appear at the end of this post. The owner of the album, I think, was Ellen Amanda Waite, "Nellie", born January 9, 1845 in Massachusetts, possibly at Hubbardston, the daughter of Increase Sumner Waite and Mary Jane (Tucker) Waite. Nellie had three sisters. On October 6, 1869 at Worcester, Massachusetts, Nellie married second cousin Samuel D. Waite, son of Andrew Jackson Waite and Sarah (Hurd) Waite. Nellie's grandfather Moses Waite was a brother to Samuel's grandfather Samuel Waite. Nellie and Samuel made their home at Worcester, Massachusetts, where Samuel was a dry goods merchant. They had, perhaps, eight children from 1871 until 1883. 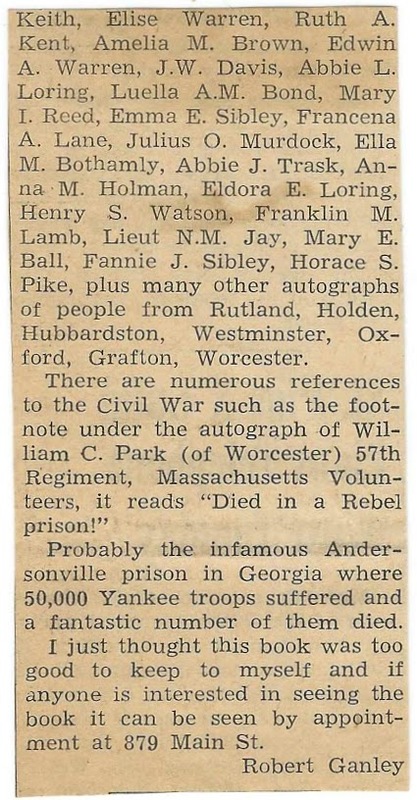 On the page Corporal Alonzo W. Bond of Leicester, Massachusetts, shared with Helen D. Joslin of Westminster, Massachusetts, he inscribed "Remember the Dress Parade we had, before the Company knew how to do it." 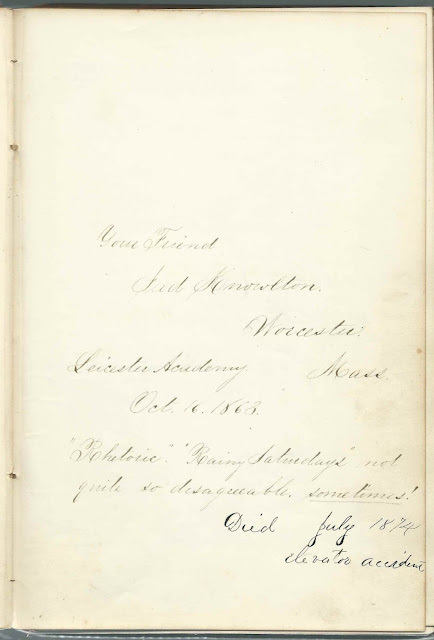 Fred Knowlton of Worcester, Massachusetts, inscribed a page at Leicester Academy on October 16, 1863. Nellie left a sad note: "Died 1874, elevator accident". In the History and Alumni Record of The State Normal School at Bridgewater, Massachusetts, to July 1876, compiled by Albert G. Boyden, Fred's death year was given as 1873. William C. Park of Worcester, Massachusetts, inscribed a page on November 16, 1863. "Orderly Sergeant" "57th Regt. Mass. Vols. 1866. Later note: "Died in a Rebel Prison". I'm not sure of the significance of the year 1866, unless some prisoners were too ill to be moved after the war's end or Nellie erred. Mary A. Forbush inscribed a page at Westminster, Massachusetts, on February 10, 1865. Nellie left a sad note: "(suicide) 1872". And my favorite: Mary E. Ball of Leicester, Massachusetts, inscribed a page on November 12, with no year given, and added: "Ever remember bayonet exercise, your fear for the safety of you know who. Oh - Nellie, they don't intend to injure each other." Mary Allen of Hubbardston, Massachusetts, inscribed on September 2, 1865. "Let Mind and Right assert their sway and march to victory in firm array." Nora D. Baker of No. 1 Pleasant St., Westminster, Massachusetts. Shared the page with Lue A. Harrington and Mary J. Leighton. Mary E. Ball of Leicester, Massachusetts, inscribed on November 12 [no year written]. "Ever remember bayonet exercise, your fear for the safety of you know who. Oh - Nellie, they don't intend to injure each other." Corp. Alonzo W. Bond of Leicester, Massachusetts, inscribed on November 10, 1863. "Remember the Dress Parade we had, before the Company knew how to do it." He wrote the initials "L.C." Shared the page with Helen D. Joslin. Amelia M. Brown, inscribed at Leicester Academy on October 14, 1863. Nellie's later note: "Died Dec. 24, 1872"
Glover Clapham of 716 Broadway, New York. He wrote the initials "L. C.". John C. Denny of Suggsville, Alabama; wrote initials "L.C." Elmira A. Eager of Westminster, Massachusetts, inscribed on May 3, 1865. She shared the page with Addie Prentiss. Corp. S. J. Emerson of Millbury, Massachusetts; wrote the initials "L. C."
Emma A. Estey of Westminster, Massachusetts, inscribed on October 7, 1864. Shared the page with Sarah J. Wyman. Mary A. Forbush, inscribed at Westminster, Massachusetts, on February 10, 1865. Nellie's later note: "(suicide) 1872"
Emmie D. Gates of Rutland, Massachusetts, inscribed at Leicester Academy on November 19, 1863. She shared the page with Maria Warren. Mary E. Giles of Westminster, Massachusetts, inscribed on October 15, 1864. Nellie's note: "Died"
M. C. Goodwin of Princeton, Massachusetts, inscribed on February 11, 1864. Wrote the initials "L. C."
Henry S. Hall of Sutton, Massachusetts, inscribed on November 18, 1863 at Leicester Academy. He wrote the initials "L.C." Lue A. Harrington of No. 1 Pleasant St., Westminster, Massachusetts. Shared the page with Nora D. Baker and Mary J. Leighton. Anna P. Henshaw, inscribed on October 5, 1863 at Leicester, Massachusetts. According to a 1960 newspaper clipping pasted in the album, Anna would have been in her 80s at this time. Catie F. Holman of Cherry Valley, Massachusetts, inscribed on October 8, 1863. Shared the page with Lizzie Mann. Anna M. Holman, inscribed at Leicester, Massachusetts, on November 6, 1863. "Don't forget the night we went down to Mrs. G's to pay for shoes." Shared the page with Abbie J. Trask. Gilbert P. Hopkins of Goshen, New York, inscribed on November 12, 1863. He wrote the initials "L. C.". Lieut. N. M. Jay of Leicester, Massachusetts. He wrote "L. C.". "Bay State Christmas 1863"
Helen D. Joslin of Westminster, Massachusetts, inscribed on April 24, 1865. 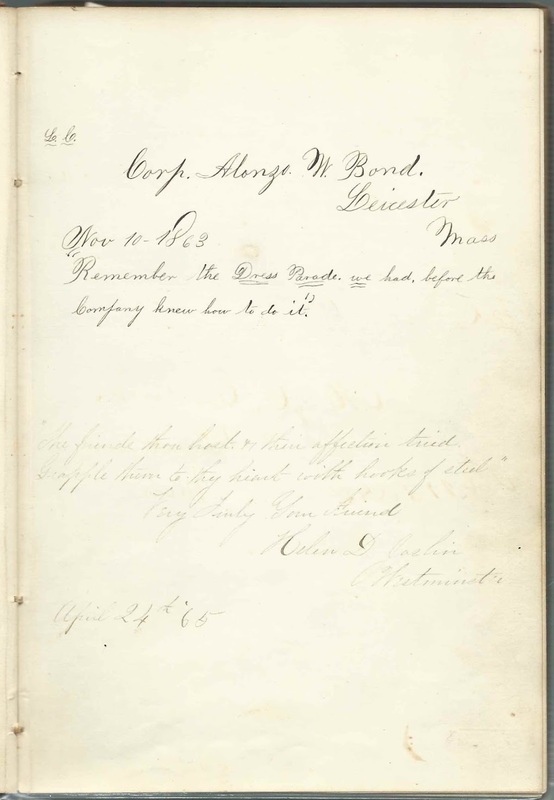 Shared the page with Corp. Alonzo W. Bond. Walter Keith of Whitinsville, Massachusetts, inscribed at Leicester, Massachusetts, on May 22, 1866. Middle initial might be C or O.
Hattie E. Kent of Leicester, Academy in Massachusetts; she wrote the initials "O. M. L.". She shared the page with Nellie Mann and Emma D. Mann. Ruth A. Kent of Leicester, Massachusetts; she wrote the initials "O. M. L."
Fred Knowlton of Worcester, Massachusetts, inscribed at Leicester Academy on October 16, 1863. Later note, left presumably by Nellie: "Died July 1874 elevator accident"
Franklin M. Lamb, inscribed at Leicester, Massachusetts, on November 20, 1863. "Singing sounds very well on Sunday evening." Francena A. Lane of Leicester, Massachusetts, inscribed on November 23, 1863. "Won't you dance? Grandfather won't let me." Mary J. Leighton of No. 1 Pleasant St., Westminster, Massachusetts. Shared the page with Lue A. Harrington and Nora D. Baker. 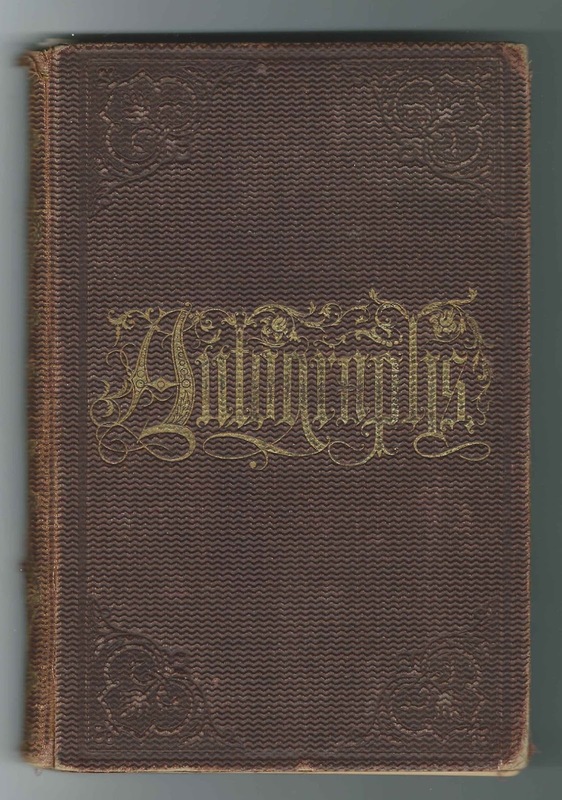 Abbie L. Loring of Leicester, Massachusetts, inscribed on November 17, 1863 "Is Nellie at home? No, she's gone upstairs"
Eldora E. Loring of Leicester, Massachusetts, inscribed on January 14, 1864. "remember the evening I had 'an engagement' and didn't go to ride. Apples and Cider." Frank M. Lyon of Fitchburg, Massachusetts, inscribed at Leicester Academy on March 1, 1864. He wrote the initials "L. C."
Lizzie Mann of Leicester, Massachusetts, inscribed on October 8, 1863. Shared the page with Catie F. Holman. Nellie Mann of Leicester, Massachusetts, inscribed at Leicester Academy in Massachusetts. She wrote the initials "O. M. L.". She shared the page with Emma D. Mann and Hattie E. Kent. Mary J. Mansur of Westminster, Massachusetts, inscribed on March 6, 1865. "Keep your promise March 6, 1870". Presumably Mary and Nellie had made plans to meet again in 5 years. J. E. McClellan of Grafton, Massachusetts, inscribed on November 17, 1863. Wrote the initials "L. C."
Ella Merriam, inscribed at Westminster, Massachusetts, on October 20 [no year written]. She shared the page with A. W. Prentiss. Alex. R. Merriam of Goshen, New York, inscribed in November 1863. He wrote the initials "L. C."
Helen E. Morse of Hubbardston, Massachusetts, inscribed on Wednesday, December 2, 1863. "How do you do H in the entry and the bow of Leicester cadets"
Orange H. Morse of Westminster, Massachusetts, inscribed on October 7, 1874. shared the page with W. H. S..
Julius O. Murdock of Leicester, Massachusetts. 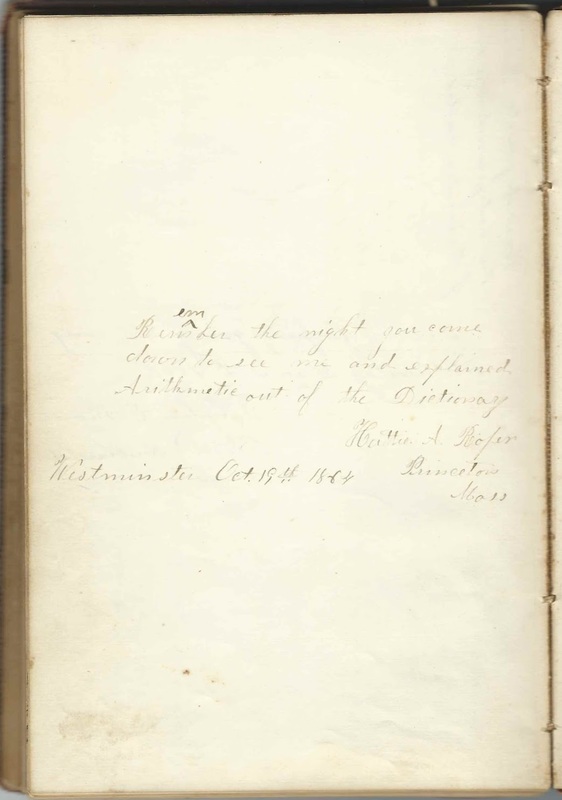 "Have you got any Cider"
Abby B. Newton of Cedarville, Westminister, Massachusetts, inscribed on October 15, 1864. "Nellie, Remember Westminster Academy, the music of Violins, Drums & Dulcimer"
Frederic A. Olney of Oxford, Massachusetts. 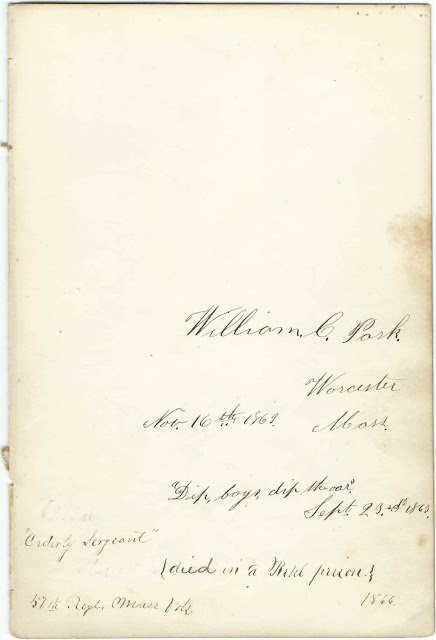 He wrote the initials "L. C."
William C. Park of Worcester, Massachusetts, inscribed on November 16, 1863. "Orderly Sergeant" "57th Regt. Mass. Vols. 1866. Later note: "Died in a Rebel Prison". Not sure what the year 1866 means, unless some prisoners were too ill to be moved after the war. Mary M. Peckham of Westminster, Massachusetts, inscribed on October 31, 1864. "Remember Putnams problem"
Horace S. Pike of Leicester, Massachusetts, inscribed on February 12, 1864. Shared the page with Watson E. Tucker. Addie Prentiss. She shared the page with Elmira A. Eager. 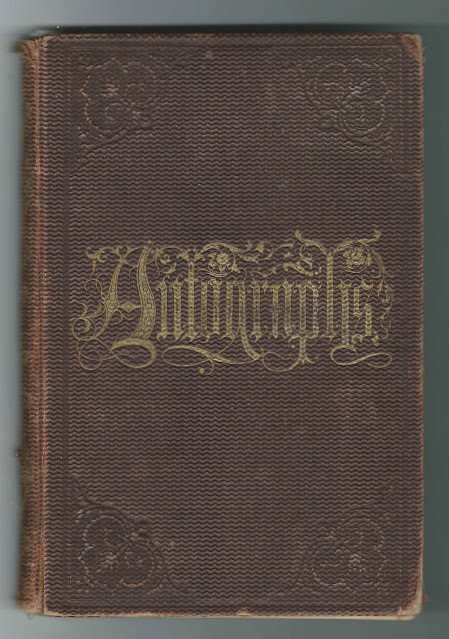 A. W. Prentiss, inscribed on March 22, 1866. Shared the page with Ella Merriam. Nellie's later note: "Died June 1873". Mary L. Reed, inscribed at Leicester Academy, at Leicester, Massachusetts, inscribed on November 7, 1863. She shared the page with Abbie J. Tripp. Hattie A. Roper of Princeton, Massachusetts, inscribed at Westminster, Massachusetts, on October 19, 1864. "Remember the night you came down to see me and explained Arithmetic out of the Dictionary." W. H. S. Shared the page with Orange H. Morse. Walter H. Sanborn of 15 Hayward Place, Boston, Massachusetts. He wrote the initials "L. C."
Fannie J. Sibley of Leicester, Massachusetts, inscribed on January 28, 1864. Nellie's note: "Died July 1867"
C. F. Spear of New York City, inscribed at Leicester Academy on March 4, 1864. Wrote the initials "L. C." and "Remember the Drummer boy"
S. W. Stockwell of Westminster, Massachusetts, inscribed on April 15, 1865. Wrote "Fitchburg"
A. M. Thomas of Oakdale, Massachusetts. Wrote "L. C.". "Remember Christmas 1863. Sleigh ride. (Ahem) Shakesper. Parquet No. 97.98" Penciled note, possibly written by Nellie: "Boston now"
Abbie J.Trask, inscribed at Leicester Academy on November 6, 1863. "Never sing when you are walking down the plank walk." Shared the page with Anna M. Holman. Abbie J. Tripp of Rutland, Massachusetts, inscribed on November 8, 1863. She shared the page with Mary L. Reed. Watson E. Tucker of Southampton, Massachusetts, inscribed on November 29, 1867. "Remember that Beautiful ride we had that afternoon we went to singing school." Shared the page with Horace S. Pike. Nellie A. Waite, inscribed at Leicester Academy in September 1863. Album owner. Maria Warren of Leicester, Massachusetts. "Boat-ride"; want some lillies" [sic]; "Give me that photograph". She shared the page with Emmie D. Gates. Henry L. Watson of Leicester, Massachusetts, inscribed on November 19, 1863. "That side-splitting Romance of D. P. will always have a laughable phase in your Memory. O how nice it does fit. Pussycats Ahoy"
George H. Welles of Daver, Illinois; possibly Davis, Illinois, but the i isn't dotted, if so. William A. Whittaker of Princeton, Massachusetts, inscribed at Leicester, Massachusetts, presumably at Leicester Academy, on February 11, 1864. Sarah J. Wyman of Wachusettville, Massachusetts, inscribed on October 18, 1864. Shared the page with Emma A. Estey.